Preliminary design drawing for Battleship # 40, which was planned for construction in Fiscal Year 1915. 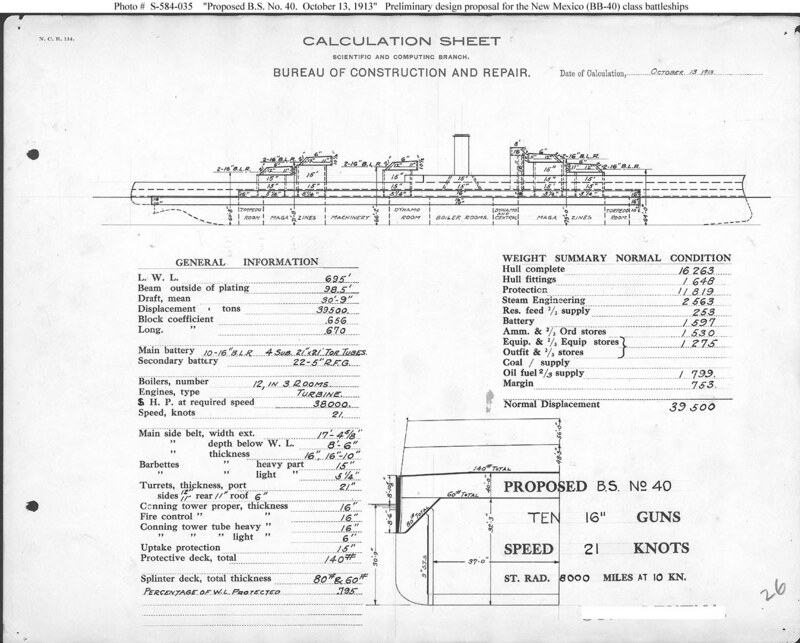 This drawing was submitted to the Executive Committee of the General Board on 14 October 1913, in response to a request at a hearing on 10 October for a modification to the earlier scheme having ten 16-inch guns (see Photo # S-584-031-A) to add the same heavy protection provided in a design (see Photo # S-584-032) providing eight 16-inch guns and 16-inch side armor. It thus became the sixth scheme of six considered (and given numbers # 1 through # 6) at a follow-up Board hearing on 21 October. 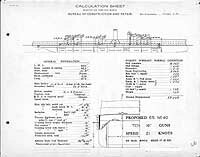 This plan provides ten 16-inch guns, turbine machinery, and a speed of 21 knots in a ship 695 feet long on the load water line (L.W.L. ), 98.5 feet in beam, with a normal displacement of 39,500 tons. Ultimately, however, Battleship # 40 was built to a design very similar to Battleship # 38, mounting twelve 14-inch guns.